Buy Californai Valencia Oranges Online...juicy! Enjoy the taste of summer with our LOVE® brand Premium Valencia Oranges from Pearson Ranch! These Valencia Oranges are tangy and sweet and filled with delicious juice. Not only high in nutrition and Vitamin C, they will be high on your list of foods perfect for the days filled with sunshine. Easy to pack in a picnic basket, back pack, or even ice chest, you can take your Valencia Oranges everywhere your summer adventures take you...hiking, camping, the park, or even to the beach! And like everything else from Pearson Ranch, these oranges come with our 100% satisfaction guarantee. So go ahead, order a 35 pound box of sunshine and we will have them shipped right to your door. This year, why not treat yourself or someone special to a "Summer of LOVE"! 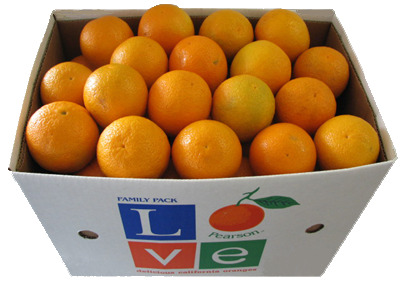 Love® Premium Valencia Oranges 35 lbs.